today is the birthday of langston hughes - a major figure of the harlem renaissance. today is also the first day of black history month - and here on the mouse it is also wall wednesday. today's post weaves bits and pieces of all that (and more). today's wall is from a wander a couple years ago i went on in harlem specifically looking for interesting street art. 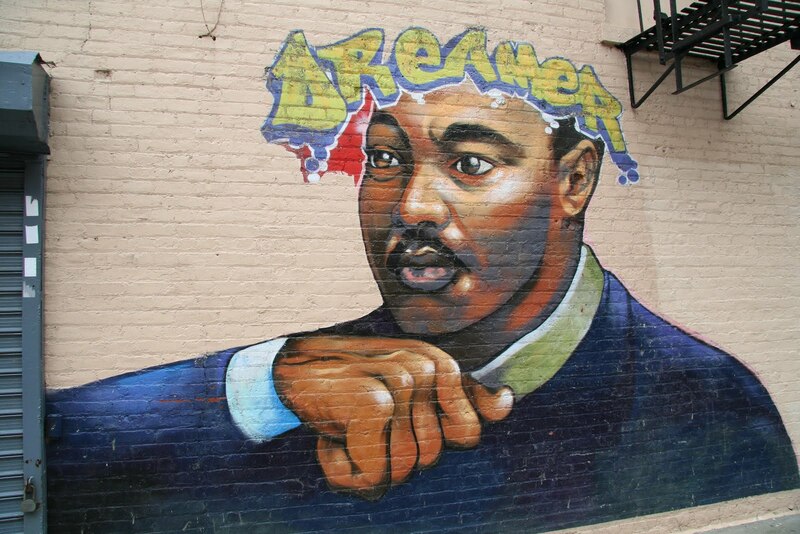 the portrait isn't of langston but of another great african-american dreamer - martin luther king jr. langston huges lived in harlem - beginning in 1920 when he moved to new york city to attend columbia university and then on and off for the rest of his life. although he was an very good student he left columbia in 1922 because of racial prejudice. after leaving columbia, he became increasingly involved in the art and activism of harlem from the early 1920s until his death in 1965. his ashes are interred at the schomburg center for research in black culture in harlem. you would think that somewhere in my cache of snaps i would have a mural or some street art - from harlem or even cleveland - with a portrait of hughes, but if i do i have yet to find it. one of these days i really have to get all my photos organized. oh yeah! tone poem by jazz musician charles lloyd performed by charles lloyd (tenor sax), michel petrucciani (piano), cecil mcbee (bass), jack dejohnette (drums). i had hoped to find a vid of lloyd performing a tune from his album dream weaver but couldn't find any of the tunes on youtube. but that's cool, the tune i did find - tone poem is short and sweet and the title is pitch perfect. This is a great poem.. It's funny. I was just looking at a children's book I have on Langston Hughes by Alice Walker.